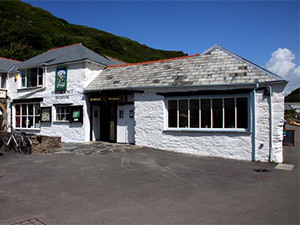 The Museum of Witchcraft and Magic can be found at Boscastle and makes for a spellbinding experience! Established here in 1960 by Cecil Williamson (18 September 1909 – 9 December 1999), it has become one of Cornwall's most popular museums and it has the largest collection of witchcraft and Wiccan-related artifacts in the world. It explores British magical practice, making comparisons with other systems of belief, from ancient times to the present day. Pictured left is the Museum courtesy of Steve Daniels. Penally House was contructed in 1836 for Boscastle merchant, William Sloggatt. Sloggatt was a suspected smuggler and his family play a prominent part in local history. As such, the house is now a Grade II Listed Building. However, it is now partly divided into flats. As it is a private dwelling, it is NOT open to the public. According to Peter Underwood, the house had a reputation for being haunted by the ghost of a former owner named Colonel Hawker. A mysterious figure has been sighted and footsteps heard. Pictured left is a view of Boscastle with Penally Hill to the right courtesy of Richard Law. 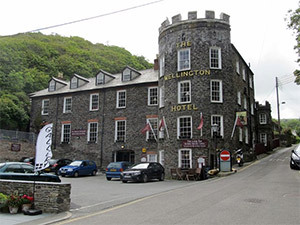 The Wellington Hotel is one of North Cornwall’s oldest Coaching Inns, dating back to the 17th Century. It was originally known as “The Bos Castle Hotel”, but was renamed in memory of the Duke of Wellington following his death. Its Castilian tower, still seen as the main feature on the exterior of the hotel, was added and the hotel renamed The Wellington Hotel. According to Peter Underwood, the hotel has a number of ghosts associated with it. These include a figure that could be "a coachman or stable lad", a male that allegedly committed suicide here, a little old lady and that of a young girl. Presences have been felt in rooms. Pictured left is the Wellington Hotel courtesy of Ian Rob. Boscastle (Cornish: Kastel Boterel) is a village and fishing port on the north coast of Cornwall, England. It is located 14 miles south of Bude and 5 miles northeast of Tintagel. 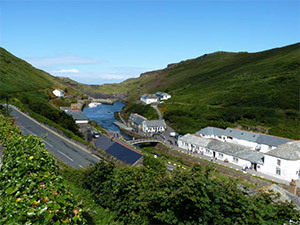 Pictured left is Boscastle harbour and landscape courtesy of Clethbridge8. Licensed under CC BY-SA 3.0 via Wikimedia Commons.